Please be patient! Don't give up on me! I really DO want to be a part of the conversation. Judy Berry works with individuals suffering from Alzheimer's and dementia at the Lakeview Ranch. She submitted her list of communication tips under the article -- Ten Tips for Communicating with an Alzheimer’s Patient. I have never seen a list of communication tips from the perspective of the person suffering from dementia. This reverses the typical communication paradigm in the Caregiver --- Patient model. 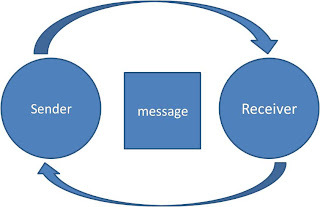 In every communication interaction there is a sender, receiver and a message. A patient and a caregiver. As caregivers, we tend to view ourselves only as senders of the message. We are always searching for ways to communication more effectively. How often do we consider that the patients is also trying to send us messages? Do we actively consider that we are on the receiving end -- that we are receivers of messages? For me, it is instructive to reverse the paradigm and to look out of the eyes of the patient. If I was the patient how would I want to be treated? If I were the patient would I want the caregiver to try and go beyond themselves and understand me? I believe I am fortunate because I went through the barrier between my mother and myself some time ago. I also noticed as part of this metamorphosis I had a new and different view of patients suffering from Alzheimer's disease. I wrote previously about how when I first saw a group of persons suffering from Alzheimer's disease it scared me. It was hard to look. Now, I find that I want to talk to them. I feel confident that I can whisper in their ear and let them know I see them. I honestly believe I do see them. I certainly see them differently. I asked myself what do I see? I see another person. It is as simple as that for me. In a way that is difficult to describe, with their dull look on their face, they seem to glow. This might sound strange -- they interest me. "I know you are in there." I now see my mother as I had always seen her. This happened when I concluded we would live our live as we always had. I did have to learn to be kinder, gentler, and more understanding. I finally came to an understanding. It was my communication and my behavior that determined the quality of our life each day. In order to communicate effectively you need to become both a sender and a receiver. The receiver learns not only to listen, but to take cues from the nonverbal behavior of the Alzheimer's sufferer. The Alzheimer's caregiver must learn by trial and error what words and what actions work. Try. Keep trying. My advice to my fellow Alzheimer's caregivers. If you want to learn how to communicate more effectively you will need to become determined to do so. It takes a serious effort all the time, every day. Change is always difficult to accomplish. There is a big difference between wanting to change, and needing to change. I want chocolate but I don't need it. Needing to accomplish something brings with it the passion to accomplish. If you accomplish this mission, not only will you improve the quality of life of the person suffering from Alzheimer's dementia, you will also be improving your own quality of life. It is my belief that by looking at communication from the perspective below instead of feeling that you are surrounded by four very high walls, you might finally see that there is a door in the room. Why not walk through the door?